For about ten months I have been doing a daily blog called I guide, You Tube. Becaused I love YouTube and noticed that many of my friends had no time to search on YouTube, I began picking a daily favourite video. I would never have seen so much videos if I hadn’t been doing this blog, because actually I am not much into moving images. I have seen very interesting stuff, and I think there are more than enough interesting videos on YouTube to continue this blog for another while. But I don’t like repeating myself, and recently I got the feeling that I was doing that. So I have decided to put an end to this project. At the same time I have decided to put more effort in The Soundtrack of my life. That began as a daily description of a random piece of music from my shelves, but I want to make it a bit more interesting. 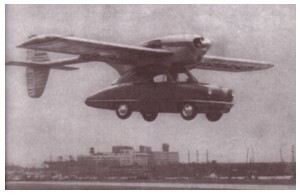 One of the recurrent items in I guide, You Tube was my search for the flying car. I have not found the video that I was after, but of course I have found other material elsewhere. I will write about that in a future episode of this Soundtrack. Of course I am not the only one who is disappointed about the way our present differs from the future that was promised us in the past. Tom Smith, who posts one of his own songs every week here, has written a song that quite says it all. It is called, of course, I want my flying car .